Thanks to the Internet we can all sit around in our pajamas any time of day or night and order clothes, toys, household items and food. Within days or sometimes even hours the items we buy land on our front doorstep waiting to be opened and used. But be careful, because the Internet can be a dangerous place for your money. Do you find yourself spending more money then you intend to each month? Do you head to Amazon every time you want to purchase something new? Do you add an item to your cart and immediately checkout without searching for deals or better bargains? Would you prefer to protect your hard-earned money? Would you like to find the lowest prices on items you want to buy? Financially savvy shoppers understand how to search for online bargains. Smart shoppers know you should never order an item without comparison-shopping. They also know it is always wise to search for an online discount code before checking out. But even those who are careful with their money may find themselves wasting time in search of cancelled promotions or invalid discount codes. Have you ever spent five or ten minutes searching for a code only to find that it doesn’t work when you enter it into the checkout field? With all that time wasted you return to the Internet in search of another code only to find that it doesn’t work either. Wouldn’t it be great to find a website dedicated to finding active, non-expired promotion codes that work every time you attempt to use them? Wouldn’t you love to find a website that lists the bargains and sales you care about the most? 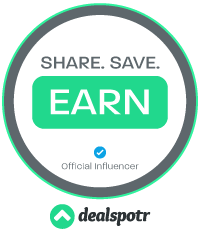 If you want a one-stop shop for bargains, discounts and deals then check out Dealspotr; a social couponing website that relies on its users to find valid, up-to-date deals. With Dealspotr you will create a profile that includes the types of deals that most interest you. Do you have children? Then select the Babies & Kids category. Do you want to explore the globe? Then select Travel. Are you interested in getting fit and losing weight then select Fitness & Sports. These categories will help Dealspotr narrow down the deals and bargains that are most suited to your needs. You can also subscribe to specific brands, topics and people to ensure you find the sales most relevant to you. These deals are added, edited and policed by Dealspotr’s 30,000 members, which means you will find active sales and coupons rather than the outdated and expired ones you may find on other deal-gathering sites. Best of all Dealspotr will pay users just for using their site. 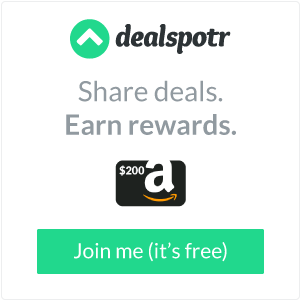 As a Dealspotr user you can earn points for posting in-store and online deals, validating the deals others have posted, finishing your daily checklist and referring new members. Those points can then be redeemed for Amazon gift cards. Saving money is always great, but earning money while bargain hunting is even better! I became a member of Dealspotr a few months ago, but over the last few weeks I’ve taken a more in-depth look at the website and found it’s just as easy to search for bargains as it is to post bargains that others may find useful. I am a coupon clipping, deal finding junkie. I don’t shop often, but I do love finding bargains especially on items I need to buy. When my youngest needs diapers I turn to the Internet in search of Pampers at the cheapest price I can find. When my husband runs out of printer paper for his business I search Staples for the highest quality, least expensive pack of paper money can buy. After all, I work hard to earn money, why shouldn’t I take a little time and effort to ensure I’m not wasting it. Would you like to find great bargains all while earning Amazon gift cards? Then click on the links within this post or the image below. This is one of my favorite sites to go to. I recommend it for anyone who loves finding deals and sharing promo codes!